WOW is really all I can say. This chicken dish is PHENOMENAL!! Quick and easy prep time (my favorite) and bursting with flavor. This dish has the creamiest lemon butter sauce ever! YUM! Also, can I just say that EVERY spice container needs to have the shaker top. The worst thing is when you go to spice your meal and the spices just dump in because you forget that one doesn’t have the shaker top. Ya, that happened to me. So while Im trying to prepare dinner I’m also straining out a huge pile of thyme from the liquid before it disperses everywhere. So. Not. Fun. Kitchen fail! HA! 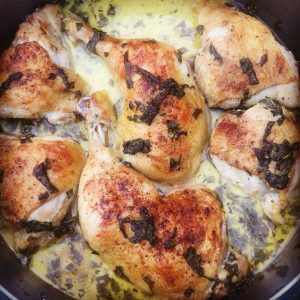 This chicken is amazing and after you try it I am sure you will add it to your weekly rotation. It’s so easy! Melt 2 tablespoons butter in large oven-proof skillet over medium high heat. Add chicken, skin side down, and sear both sides until golden brown, about 2-3 minutes per side; drain excess fat and set aside. Bring to a boil, reduce heat, stir in spinach and simmer until spinach has wilted and the sauce has slightly thickened, about 3-5 minutes. Return chicken to the skillet. Place into over and roast until completely cooked through, reaching an internal temperature of 175 degrees F, about 25-30 minutes. I like my chicken well done, when searing it I seared for about 5 minutes each side. I cooked mine for quite a bit longer as well about 50 mins. I usually watch my chicken in the oven and check it every 20 mins or so and can tell when its a nice golden brown to take it out. I hope you all like it and thank you damndelicious.net for the recipe!